Port Fairy is a town in Western Victoria that was founded as a town in 1843. There were settlers in the area before this date, and the current name for the town comes from the ship the Fairy which is believed to have arrived in the area in c.1828. The area was also regularly visited by whalers and sealers. The date of 1843 comes from the special survey which was granted to James Atkinson at that time. The special surveys were a system where the government of the Colony of New South Wales was able to control ownership of the land in the Port Phillip District. This was well before federation of Australia as a country in 1901, but also before Victoria became a colony independent from New South Wales which happened in 1851. The basic premise behind the special survey system was to stop squatters just claiming land, because when they did there was little ability to regulate it and there was no fee for the government. 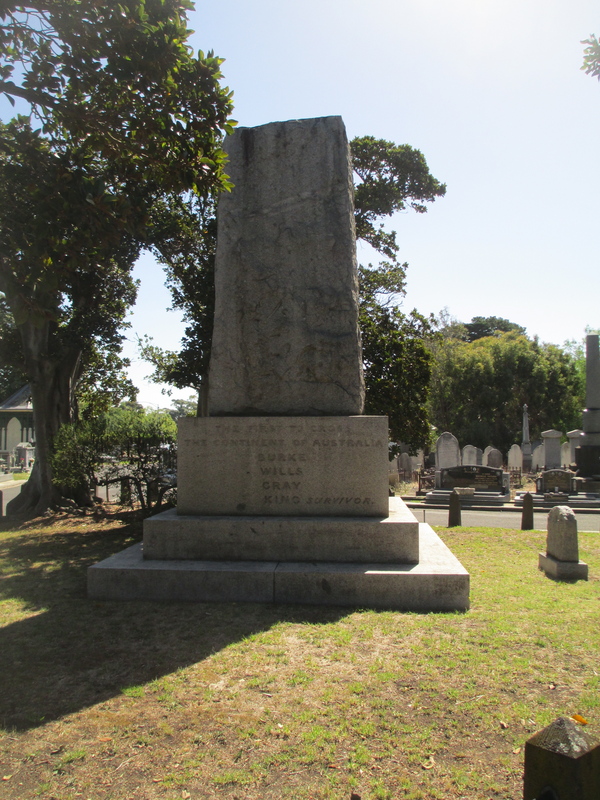 Atkinson arrived in Sydney in 1830 from Ireland and became a prominent and well connected member of Sydney society, at least partly due to his family connections to Colonel Charles Wall of the 3rd Buff regiment who was married to his sister. As he had a high social standing he couldn’t use trade to make money, so he turned to land. 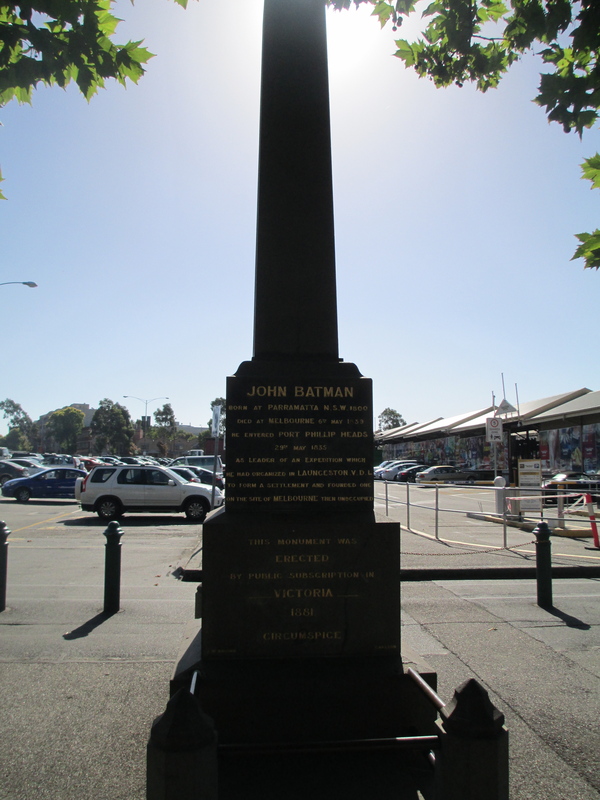 He was granted the right to the special survey of the Port Fairy region in 1843. He worked with the existing settlers, but also moved to attract new settlers to the town he named Belfast. He most likely applied for the special survey rights to the land without ever seeing it, as there is no evidence he set foot there before arriving in 1846 with his wife and seven children. He offered very long term leases for land in the town he established, but while he was definitely trying to encourage settlement he was not immediately successful. In 1848 he appointed his nephew (and my great, great, great, grandfather) Robert Henry Woodward, who was farming in the area, as his land agent. Woodward was 25 and oversaw the majority of the establishment of the town proper. It was also Woodward who oversaw, with the blessing of Atkinson, the gifting of parcels of land within the town for churches of different denominations and for community purposes, such as a post office, a hospital, government offices, public wharves, a savings bank, a town hall, public meeting places and a cemetery. 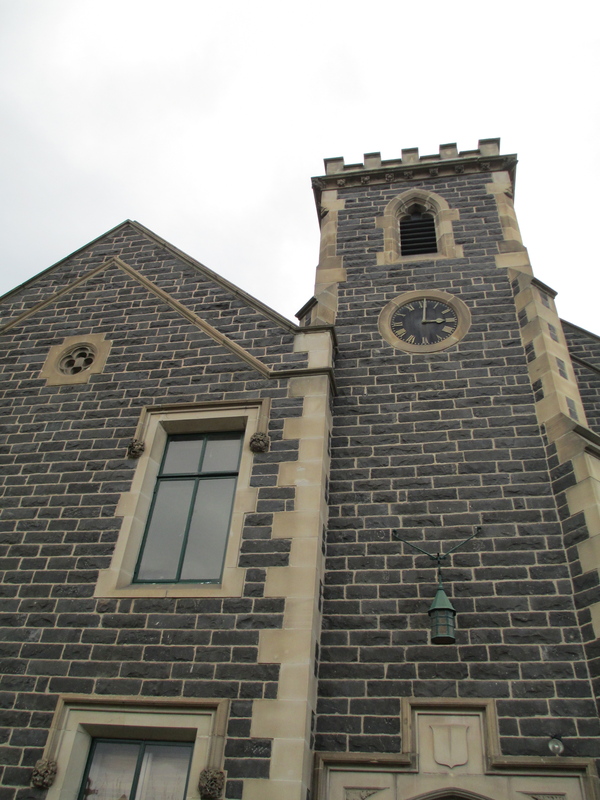 St John’s Anglican Church Port Fairy built between 1854 and 1856. It was the first church in Victoria to have a chancel. The tower was added later in the 1950s. In memory of the thousands of aboriginal people who were massacred between 1837 and 1844 in this area of Port Fairy. Today we pay our respects to them for the unnecessary sacrifices they made. This was not isolated to the Port Fairy area. The early history of Western Victoria is mired in bloodshed. A list of the frontier wars in which the indigenous population were by and large overwhelmed and destroyed by superior western weaponry can be seen here. It is essential that the past of indigenous Australians and the brutal suppression of them is recognised as part of the history of Victoria and Australia. This is especially true when discussing somewhere like a cemetery which provides concrete and tangible records of the deaths of early pioneers, a record that is not available for the deaths of the indigenous population. Port Fairy cemetery was founded in the 1850s. There is confusion as to whether it is the ‘old’ or ‘new’ cemetery as many descriptions seem to use the term interchangeably. The other cemetery at Port Fairy was laid out by Robert Hoddle, famous for Melbourne’s CBD grid, at the orders of Governor La Trobe. This other cemetery was in the sand hills out of town, was discontinued and little survives today. 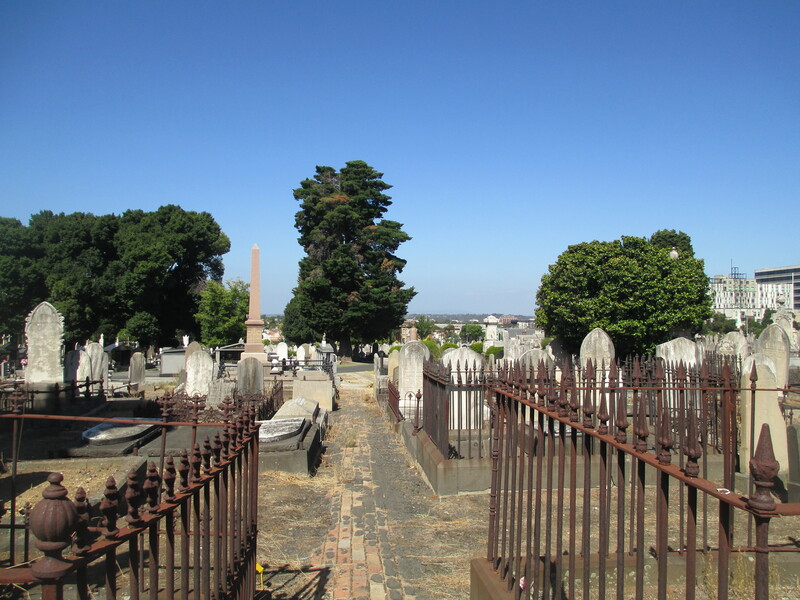 The current Port Fairy cemetery has many very early burials and is believed to be one of the first cemeteries in Victoria to have adopted the concept of a lawn cemetery. 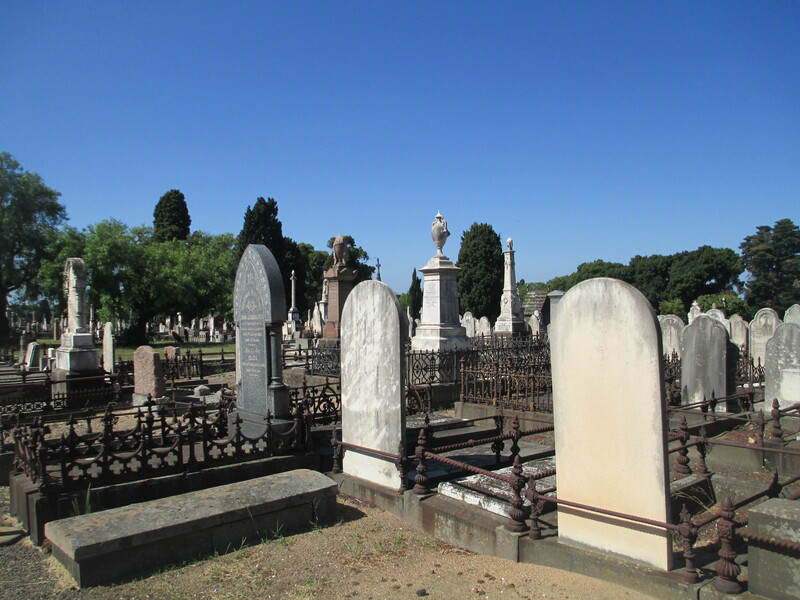 The earliest burials in the cemetery are of the local pioneers and their families. These people are often listed as from a local ‘station’ on their tombstones. The pioneers of the area did not have an easy life and as such there are a high number of young burials, very few survived to old age. 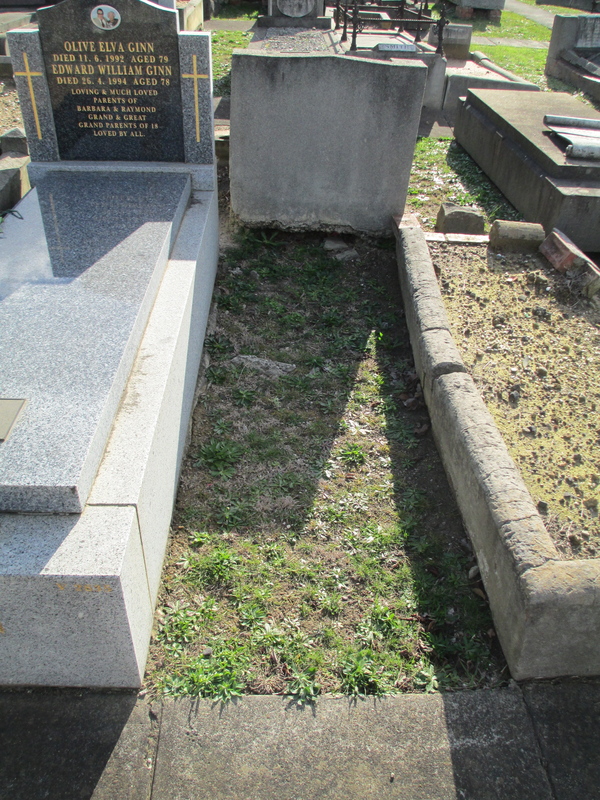 One of the earliest and one of the youngest is the grave of Harold Woodward, a son of Robert Henry Woodward and his wife Letitia Wall (daughter of Colonel Wall). Harold died on the 8th of October 1856, but was only born on the 4th of December 1855. Of Robert Henry and Letitia Woodward’s 11 children Harold was the only one to meet such an early end. I am descended from his brother Albert William Woodward, the youngest of Robert Henry and Letitia’s children. 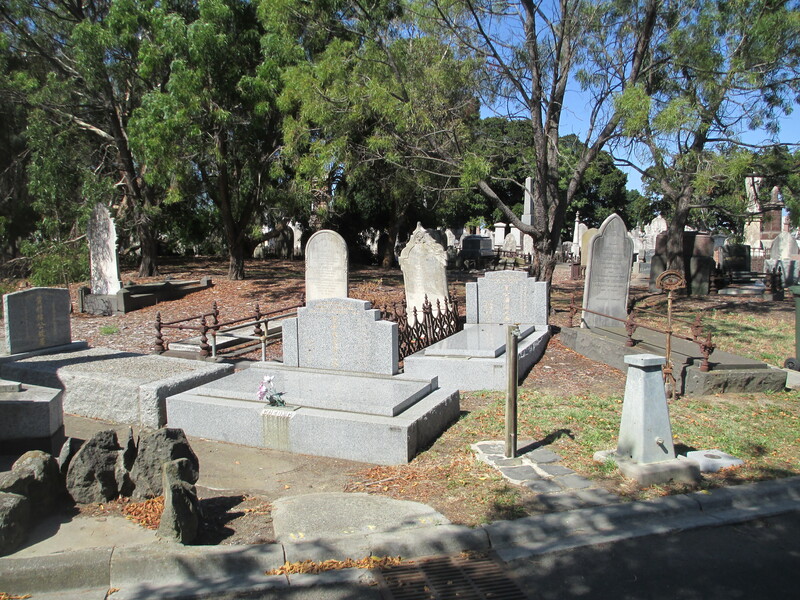 Robert Henry and Letitia are buried in St Kilda Cemetery. In affectionate memory of Abijah John Brown who departed this life July 19th 1862 aged 40 years. Watch for ye know not what hour your Lord doth come. 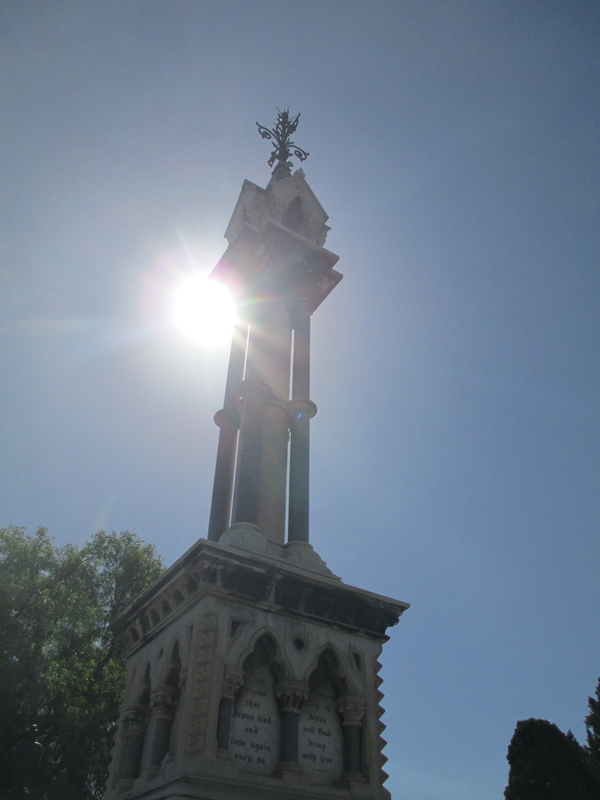 It is an interesting monument because it does not fit any regular pattern seen in Victorian era funeral monuments. It is a, sadly much worn, figure of a young man looking skywards. This man is not an angel or a cherub but a person. It is also a remarkable piece of sculpture in its own right. The Brown tomb is not alone is being striking in the cemetery. The older section of the cemetery is a combination of plain and ornate funeral monuments. Some can be seen in the photos below. There are more people buried in the cemetery than are known about. 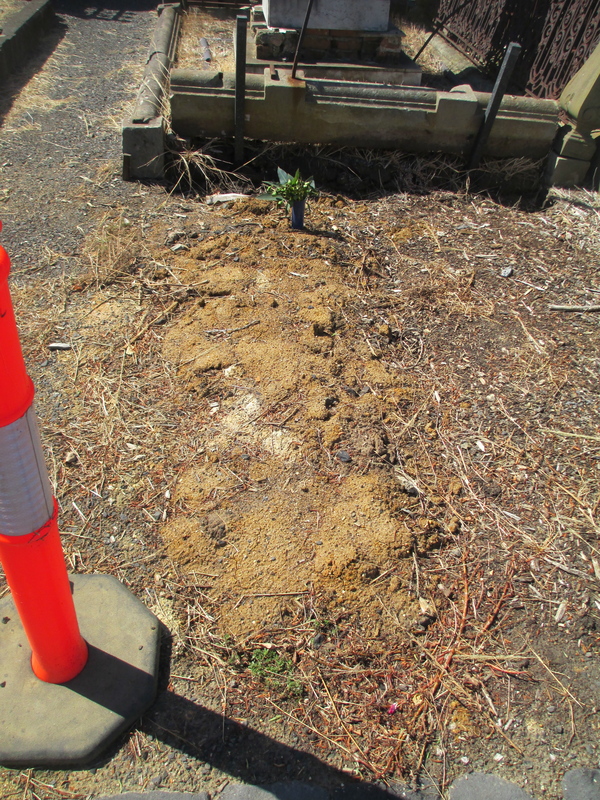 Many of the early burials would have been laid to rest under simple wood crosses and these simply wouldn’t have survived the harshness of Port Fairy’s coastal weather. Despite this, the surviving burials provide a fascinating record of the life and death of the early inhabitants of the district. 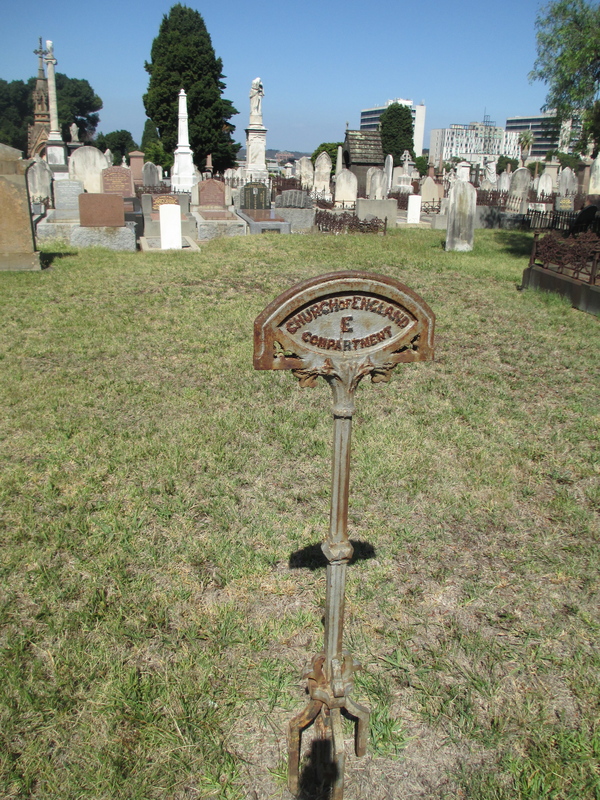 An Historic Graveyard: Some early records of Port Fairy Cemetery by P. Frazer Simons. A Special Survey: Aspects of the development of Port Fairy from 1843. Edited by Rod Collins. Tower Hill Cemetery lies between Port Fairy and Warrnambool in Western Victoria. Tower Hill itself is a former volcano not far from Port Fairy and about 3 hours drive west of Melbourne. You can see the view looking over the remains of the Tower Hill crater and looking out towards the sea from the top of Tower Hill in the photos below. Tower hill itself is not really a town, though there are a few houses around it. Tower Hill was first sighted by Europeans in 1802, the sighting was made by the Frenchmen in the ship the Geographe, but it wasn’t surveyed until 1846. In the surveys conducted between 1846 and 1850 it is described as heavily wooded, with descriptions of ferns and large trees. 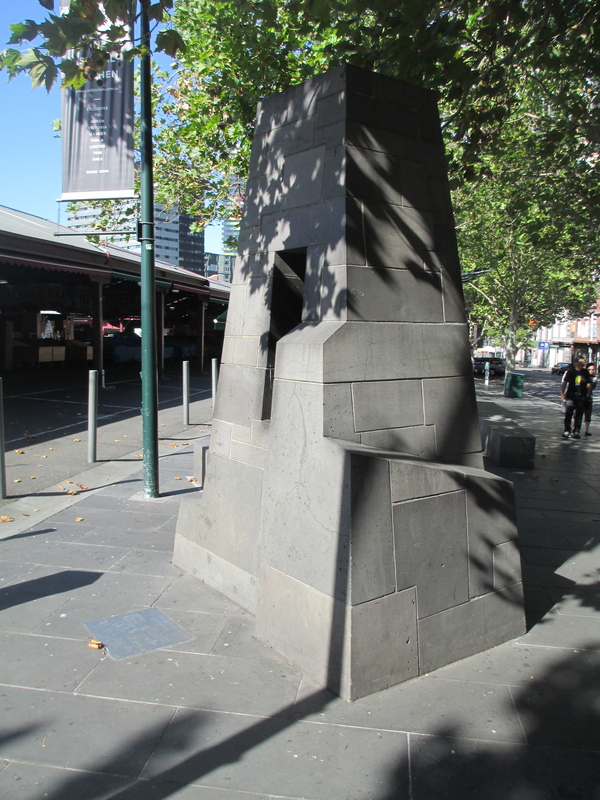 It was also a favourite site of settler James Dawson of the near by Kangatong station. He had it painted in oils in 1855 so he could show others how beautiful it was. The painting was done by Eugene Von Guerard and you can see the view from the lookout point he painted it from below. However between 1857 and 1860 the hill itself and the surrounding area was heavily deforested, mainly for the use of the timber but also for grazing. This use of the land continued until 1961 when Tower Hill was proclaimed Victoria’s seventh state wildlife reserve. There has been significant re planting done since. I would like to pause in the ongoing narrative of Tower Hill at this point to discuss its pre-European importance. When Tower Hill was first sighted by Europeans it was certainly not an unknown hill. For the local Koroitgundij people it is a site of great importance and their ancestors undoubtably would have witnessed the eruption that created the funnel shaped crater 30 000 years ago. Today there is the Worn Gundidj visitor’s centre in the middle of Tower Hill which tells the indigenous history of the site. You can see the visitor’s centre in the picture below. The cemetery at Tower Hill stands at the base of the hill’s slope. It was established in 1856 and contains some of the most impressive monuments for a cemetery of its size that I’ve ever seen. The monuments range from small, such as the heart shaped stone below. 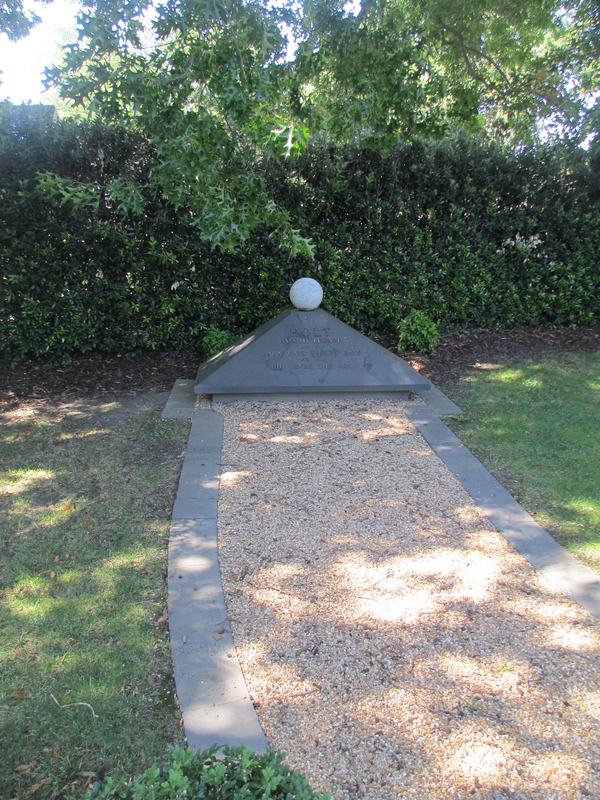 There are a number of interesting people buried at Tower Hill, but I thought I’d briefly discuss a man whose death was a key part of Australian labour history. William John Mclean was the first person to die for the union movement in Australia. Known as Billy Mclean he was born in 1869 and lived in Koroit, a small town very near Tower Hill. In the late 1800s the nearby town Port Fairy was one of Australia’s most important international ports, though you certainly wouldn’t know it now. As an important port much of the wool shorn in areas as far away as southern NSW was taken by the river system and bullock drays to Port Fairy for transportation. Shearers would hitch rides with the bullock drays back in the opposite direction for the shearing season. Billy Mclean was one such shearer. The shearers often endured awful conditions and pretty terrible pay at the same time as being forced to pay exorbitant prices for food from stores that were owned by the stations. As such there were a number of shearer strikes. On the 26th of August 1894 in NSW the paddle steamer Rodney was transporting a non union labor force up the Darling River to work at the near by station of Tolarno. Many of the river captains refused to support the pastoralists by bringing in non union labour to try to break the strikes. Captain Dickson of the Rodney was not one of them. The paddle steamer was set upon by striking shearers and after the non union labour and the crew had been removed from the boat, the shearers doused it in kerosene and burnt to the water line. The afternoon of the same day, a little further up river, Billy Mclean was one of about fifty shearers who were headed for Grassmere station near Willcannia where it was believed that non union workers from New Zealand had been brought in. Mclean was one of the first to enter the shearing shed and he was shot in the lung, one of his mates Jack Murphy was also shot. Neither died on the scene and they were arrested by the police on the way back to the strike camp. There is definite argument that the shooting was retaliation for the burning of the Rodney earlier that morning. Mclean was tried and convicted of unlawful assembly, sentenced to 3 years hard labour and sent to Goulburn gaol. In the cold of the prison and never having recovered from his injury Mclean developed tuberculosis of the lung and was sent home to his mother to die, so it couldn’t be said he died in gaol. He died in 1896. He was 26. The man who shot him was never tried and was given a medal by the pastoralists association. The other shearers rallied round Mclean’s mother and raised 90 pounds for the erection of the monument over his grave. It still stands in Tower Hill Cemetery today and is 14 feet high. You can see it in the photos below. A GOOD SON, A FAITHFUL MATE, AND A DEVOTED UNIONIST, UNION IS STRENGTH. 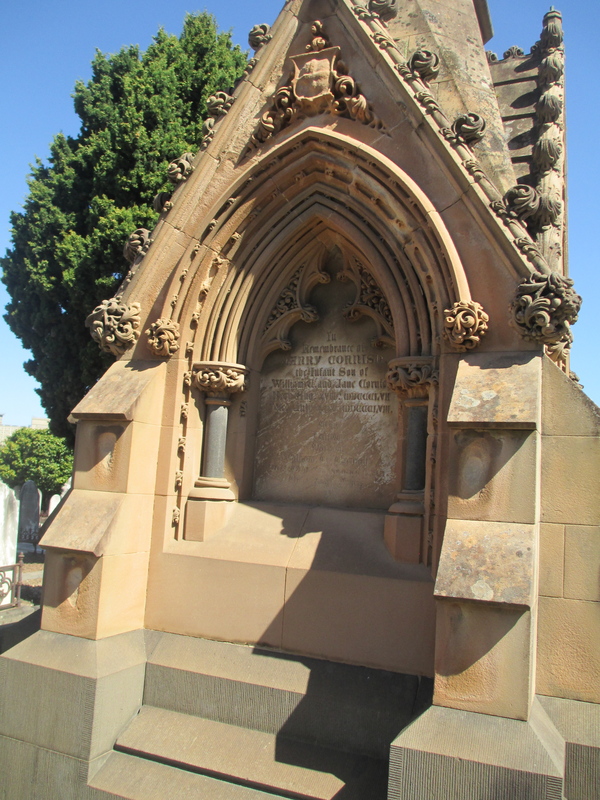 Donald MacDonald, the general secretary of the AWU wrote to Henry Lawson asking him to compose the epitaph. It is not known if Lawson did or not. 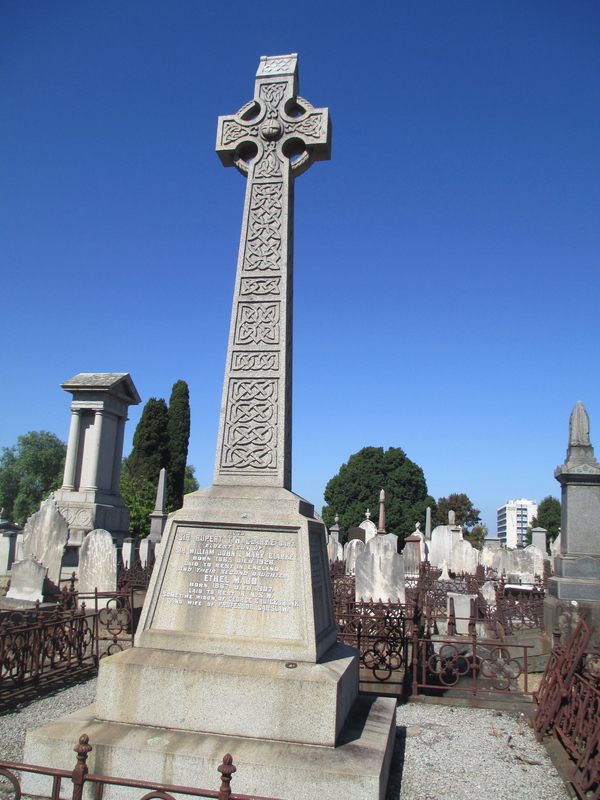 Billy Mclean is only one of a number of fascinating people buried at Tower Hill Cemetery. Alongside the outstanding individual monuments Tower Hill Cemetery also houses several groups of matching monuments such as those that you can see below. As with many cemeteries of this era, there is a distressingly large number of young deaths and whole families. You see the same surnames repeated over and over, showing the long term connection to the area. 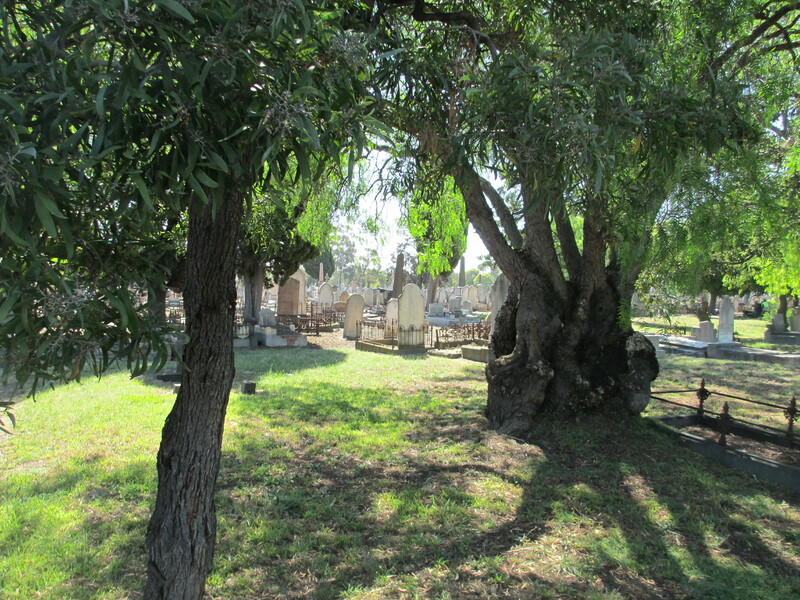 My next post will be on the nearby Port Fairy Cemetery. Tower Hill: What happened at Tower Hill? Fisheries and Wildlife Dept 1960. Tower Hill by M.C Downes. Both books can be found at the Prahran Mechanics’ Institute Victorian History Library. This is the second in my series of posts about cemeteries. 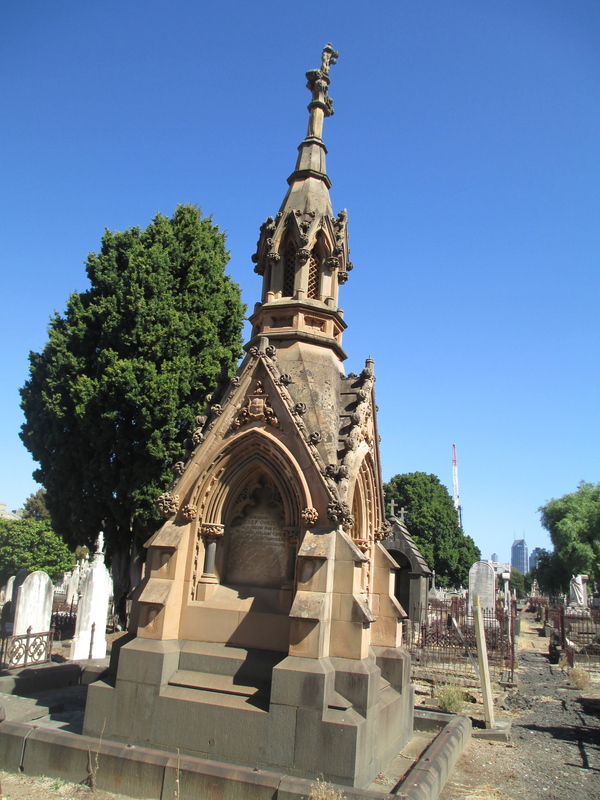 The first was about Melbourne General Cemetery and can be found here. 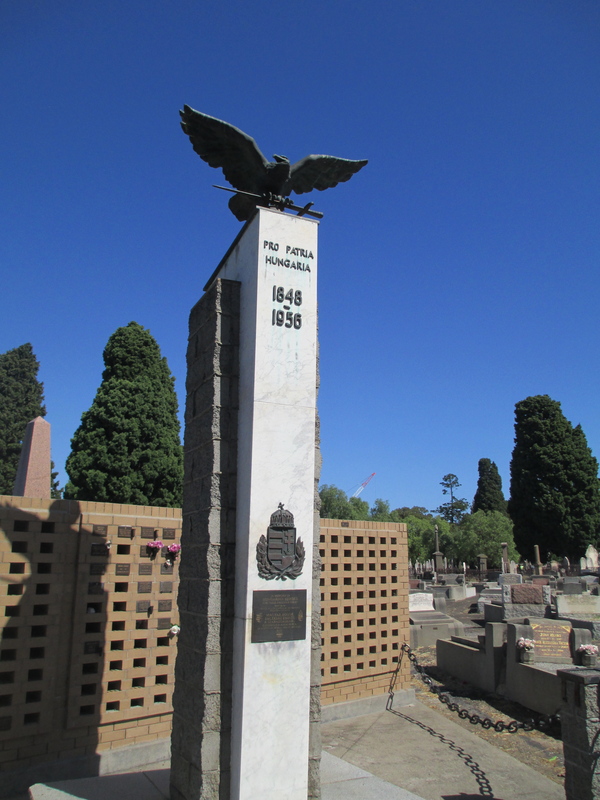 This time I’ll be discussing St Kilda Cemetery. 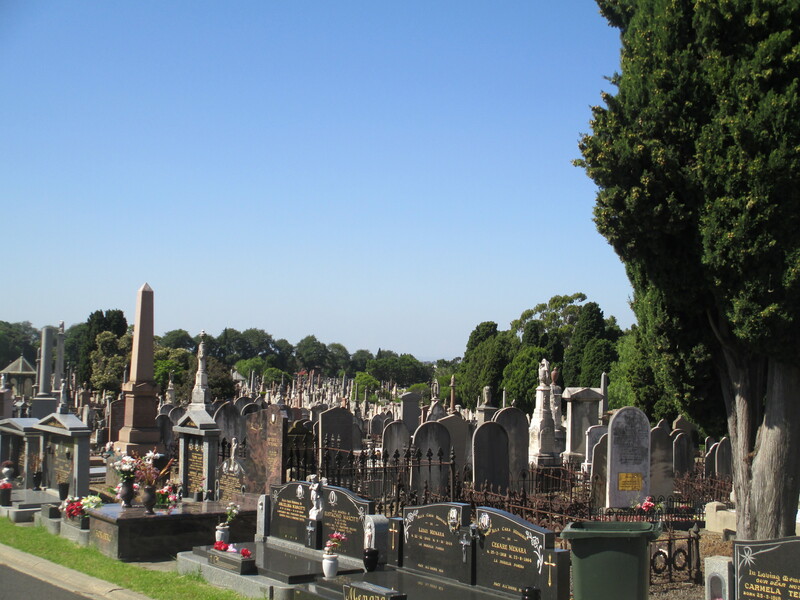 St Kilda is a suburb in southern Melbourne and its cemetery is an an excellent example of Melbourne’s inner suburban cemeteries. I’ve always found cemeteries interesting as a lens through which to view a city, or a town, and I’ve always found the history they so neatly incapsulate fascinating. St Kilda has a personal connection for me as well because there is a plot there in which several of my ancestors are buried. 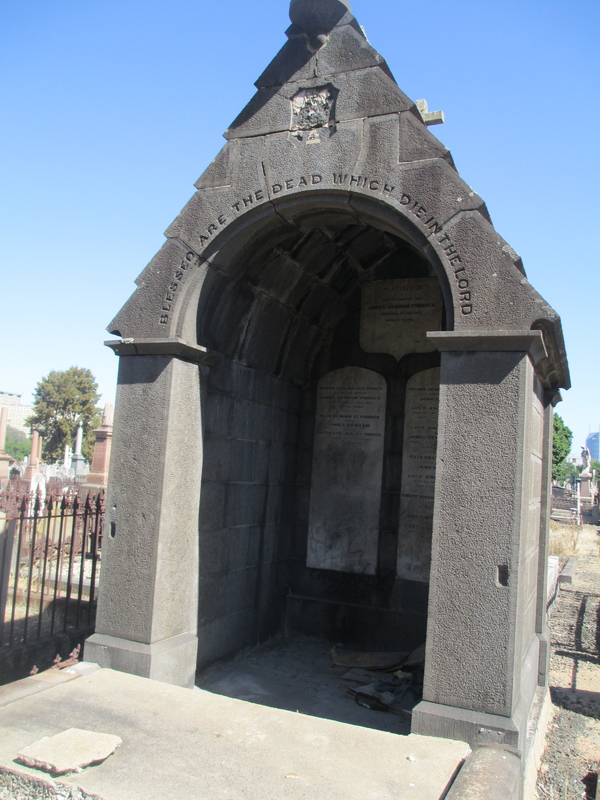 One of them, Robert Henry Woodward, was originally buried in Melbourne General Cemetery. The family believes, however, that he was moved to St Kilda to be with his wife Letitia at a later date. 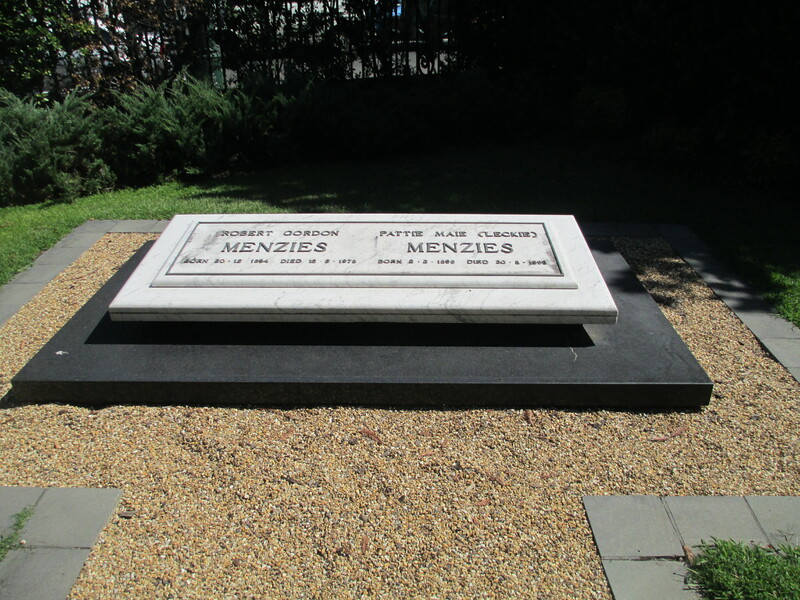 His grave at Melbourne General Cemetery is certainly unmarked. What the Woodward grave looked like in the 1970s. My extended family and I are in the process of restoring it somewhat. Robert Henry was one of my first ancestors to come to Australia in the 1850s, and Letitia was born here in 1824 when her father was stationed in Sydney. So I was interested to see where they were buried. The cemetery itself also has a fascinating history. 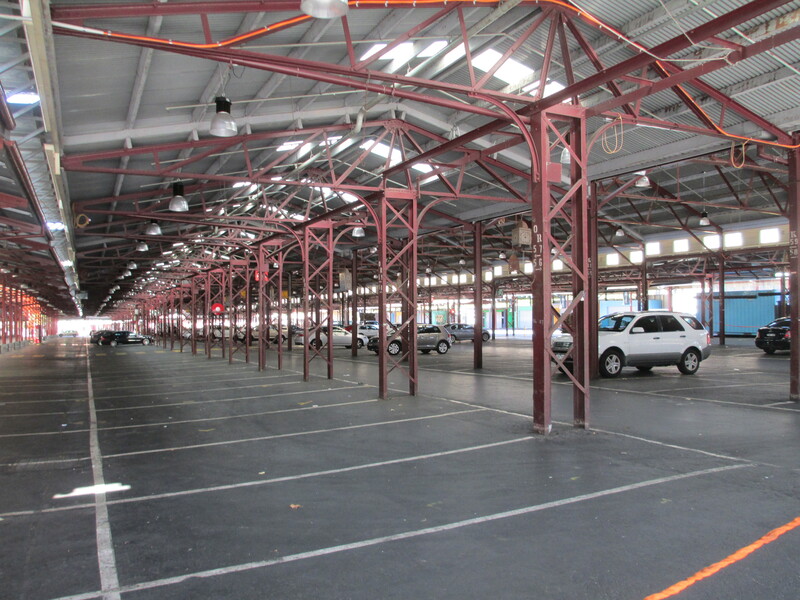 It was first laid out in 1851 by an assistant of Robert Hoddle, best known for laying out the grid of Melbourne’s CBD. It opened in 1855 and the brick wall enclosing it was added in c. 1883. 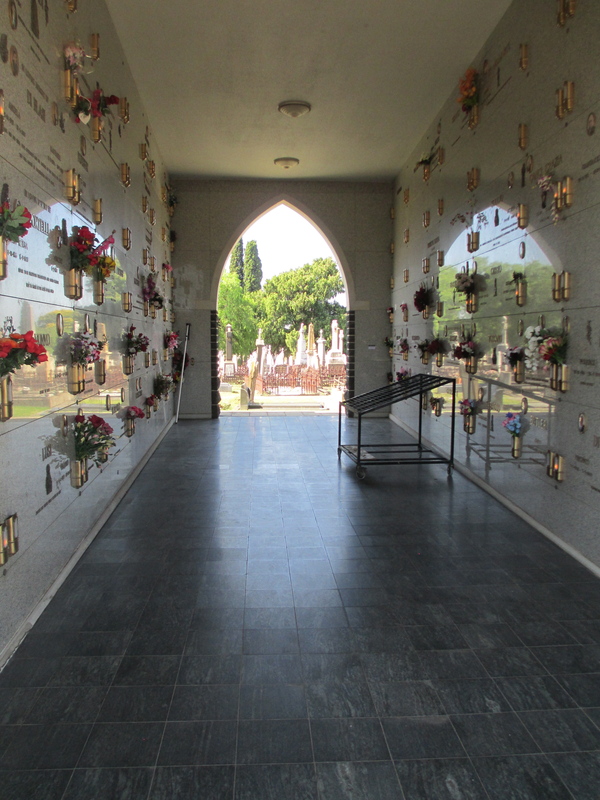 The cemetery covers 18 acres and contains approximately 53 000 burials. 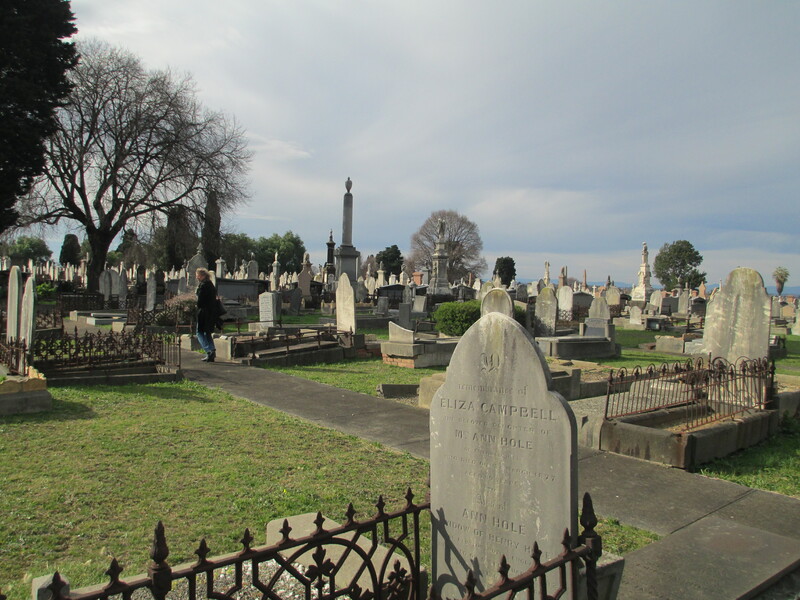 St Kilda has been a desirable place to live for over a hundred years and as urban sprawl in Melbourne has increased there have been several attempts to have the cemetery closed. Fortunately none have been successful. 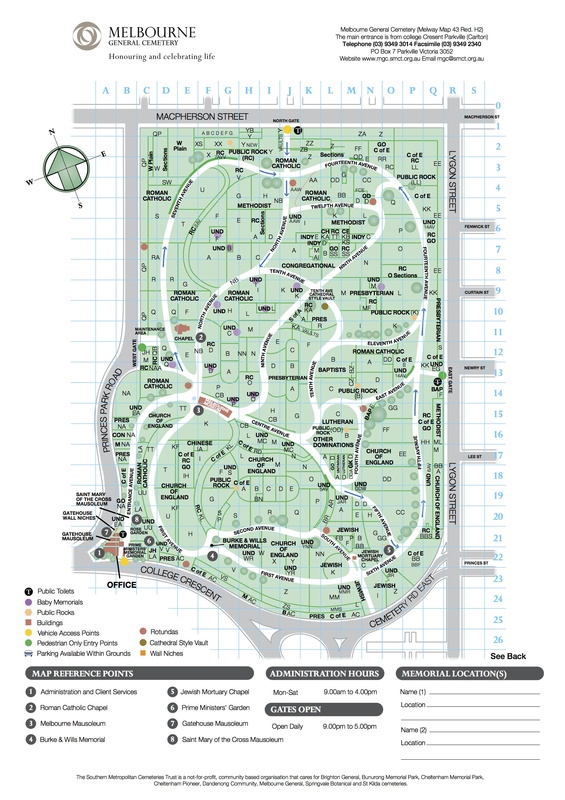 The cemetery is laid out in religious denominations as can be seen in the map below. 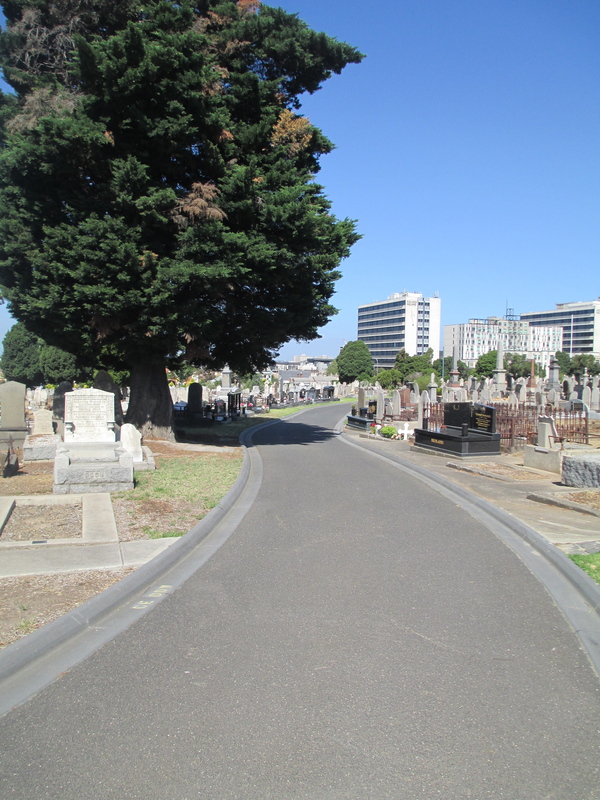 Although in comparison to Melbourne General Cemetery St Kilda is quite small, it is still large for a suburban cemetery. It certainly feels vast when you step inside, as you can see from the photos below. St Kilda also houses many beautiful funerary monuments. A number of which can be seen below. 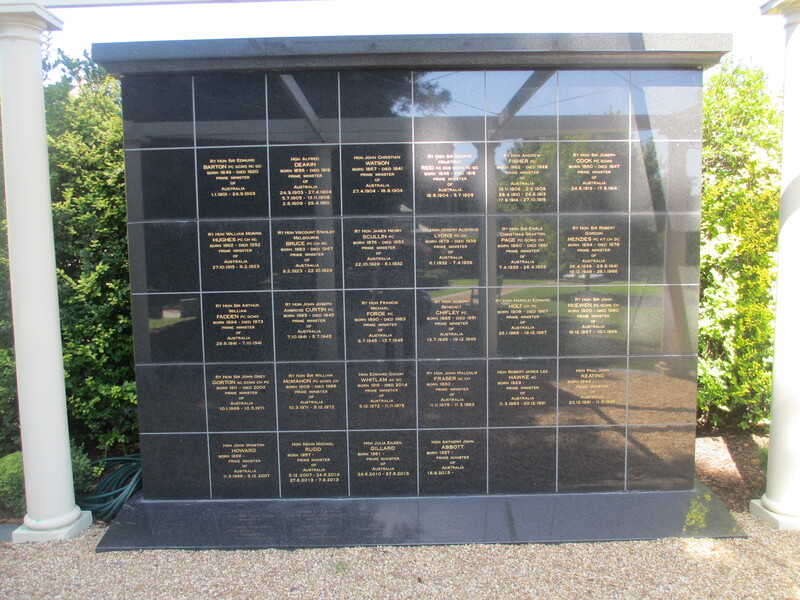 There are also memorials to a number of well known people in St Kilda Cemetery. I don’t feel it is necessary to go into the history of each of them, but I would like to discuss one in particular. Ferdinand Von Mueller, best known in Melbourne as the Director of the Royal Melbourne Botanic Gardens from 1857-1873. His memorial can be seen below. Von Mueller was born in 1825 in Rostock in Mecklenburg-Schwerin in what is now Germany. He trained as a pharmacist, but specialised in botany as part of his degree. He came to Australia in 1847 with his two remaining sisters, seeking a warmer climate for his sister’s health. He began his time in Australia in Adelaide, where he investigated the local flora as well as working as a pharmacist. 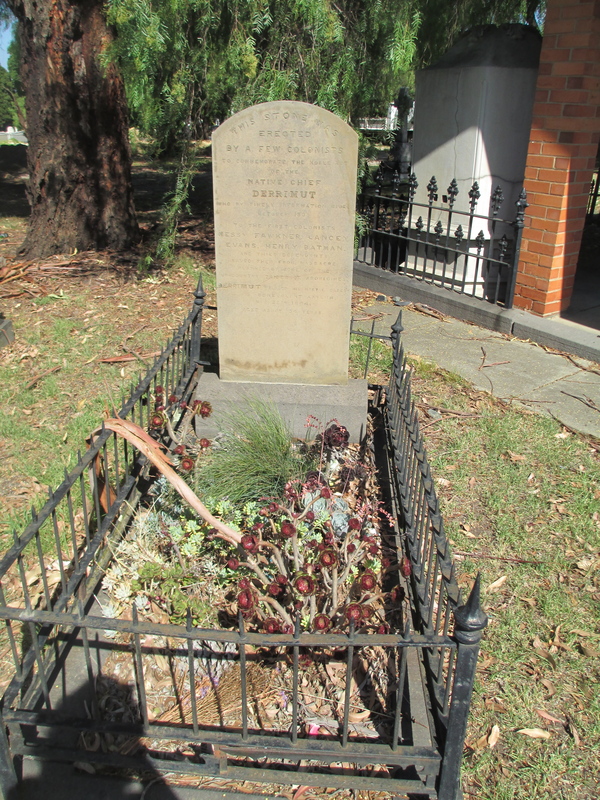 He came to Melbourne in 1852 when Governor Latrobe appointed him Government Botanist. 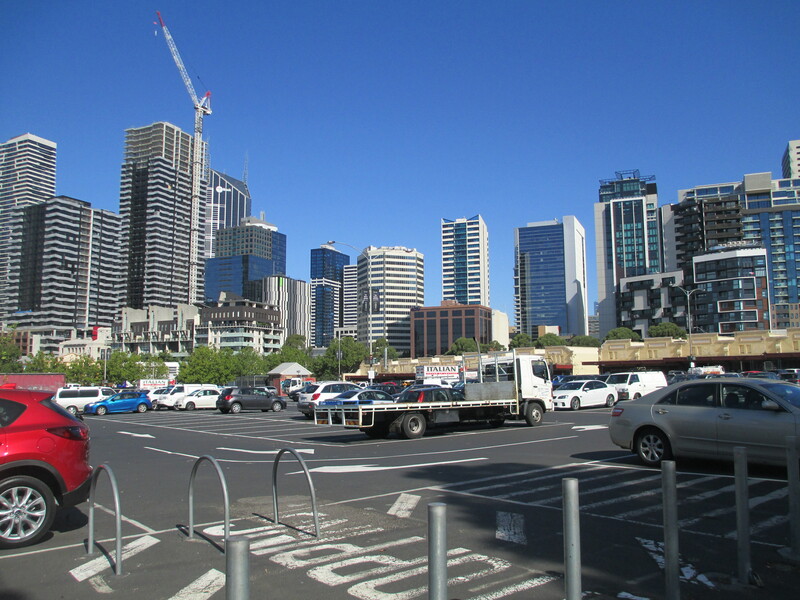 In Melbourne Von Mueller began collecting specimens of the local indigenous flora. He was instrumental in cataloguing Victorian and in fact Australian flora, adding new genera and greatly expanding exisiting knowledge. He travelled a great deal within Australia and was at the heart of bringing together isolated information from disparate sources on indigenous flora. When he was appointed director of the Melbourne Botanic Gardens in 1857 he immediately arranged to have the herbarium built, added his own extensive collection of specimens and began collecting seeds and plants from all over Australia as well as internationally. In the herbarium he built what is now one of Australia’s most important dried plant, algae and fungi collections. Under his stewardship the gardens began to build towards the magnificence which you see today. They can be seen in the photos below. Herb Garden Melbourne Botanic Gardens. Along with the Melbourne Botanic Gardens Von Mueller played a role in the establishment of some of Victoria’s numerous rural botanic gardens. 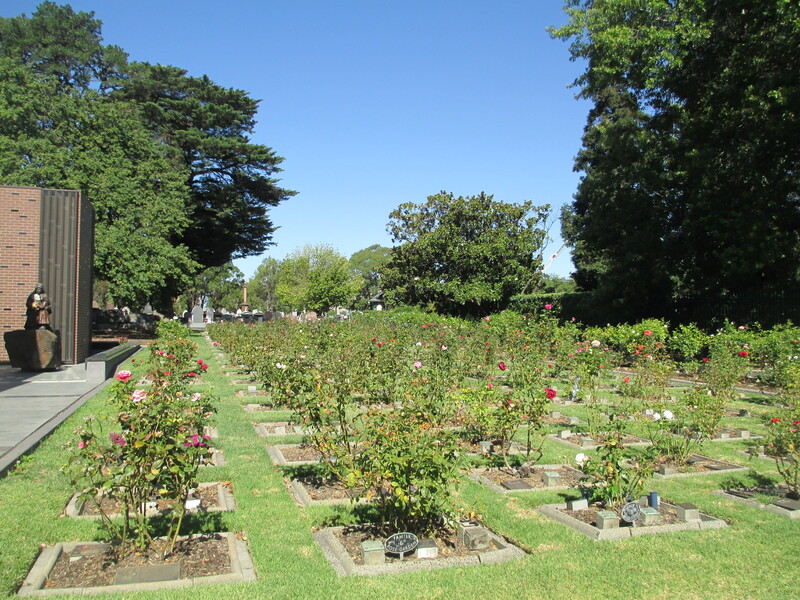 For example when the gardens in Hamilton were established in 1870 Von Mueller supplied 450 shrubs and trees, providing the start of planting for the garden. The tree below is possibly one of the ones he sent. Unfortunately he was not successful in his arguments as he was replaced as director in 1873. He remained Government Botanist, but he was so upset by his dismissal from the gardens that it is said that he never set foot in them again. Von Mueller was a dedicated worker, writing over 3000 letters a year, publishing over 800 papers as well as a number of books. By the time he died in 1896 he was largely responsible for the international recognition that was given to Australian scientific endeavour. His work was also of the quality and magnitude that much of it has still not been superseded. He is to me one of the most fascinating people with a memorial in St Kilda cemetery. 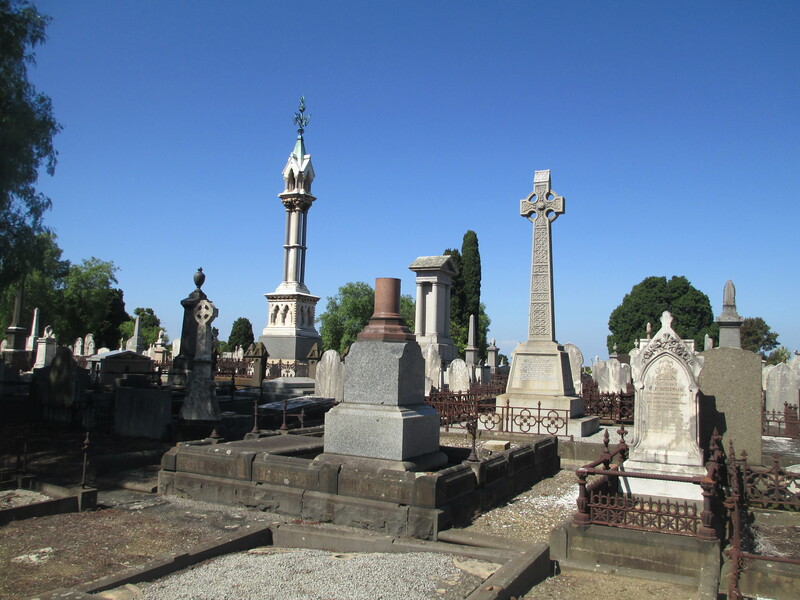 St Kilda Cemetery as a repository of history has many more stories to tell apart from Von Mueller’s and the Friends of St Kilda Cemetery do run regular tours. Information can be found here. St Kilda, like other cemeteries, is a fantastic place not just for its own history but also for the survival of the stories of the people who are buried there. 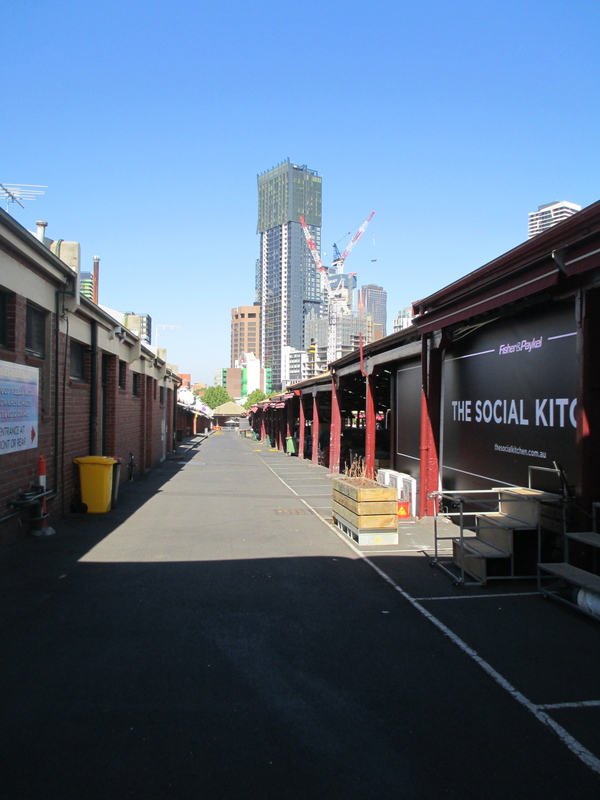 It also creates an area of community space in a tightly urban precinct. It is well worth a visit if you are ever in the area. Cemeteries, like St Kilda, are a vital part of the community. The photos are all mine apart from the photo of Von Mueller from the Dictionary of Biography and the Botanic Gardens and Hamilton Gardens pictures which were kindly provided by garden writer and photographer Penny Woodward. 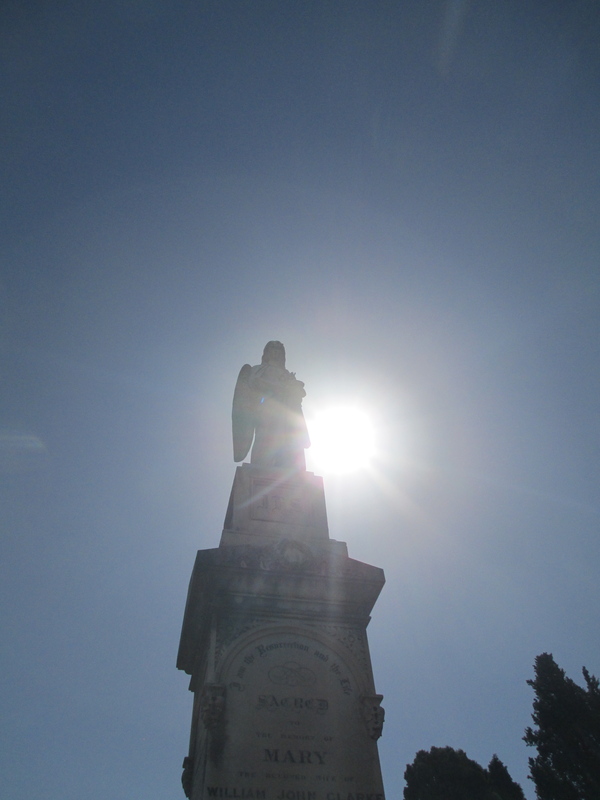 Cemeteries are always a really interesting lens through which to view the history of a city. 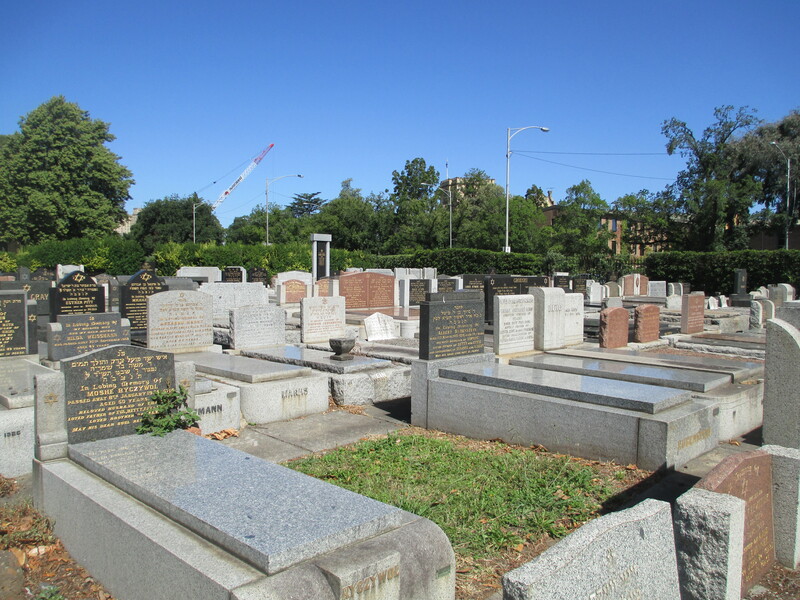 In the case of Melbourne is has several old cemeteries as well as the more modern ones. 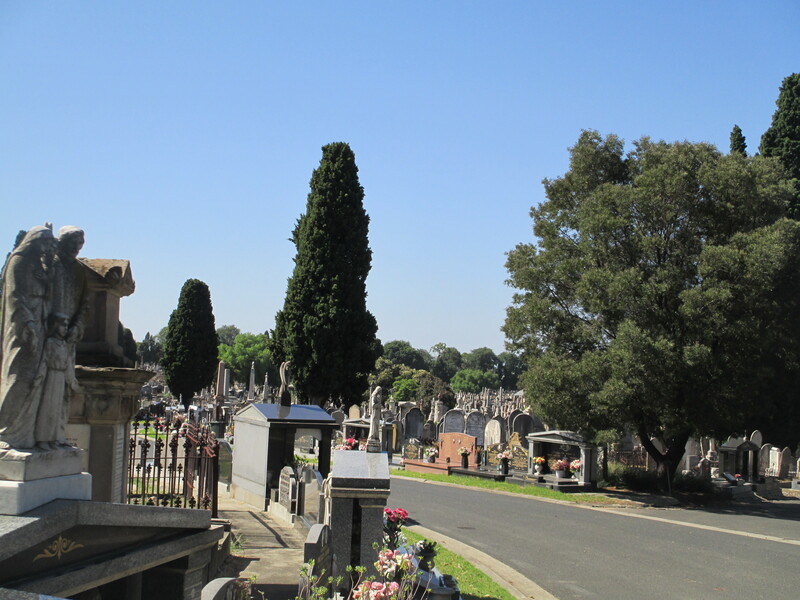 I thought I’d start with the Melbourne General Cemetery as it is one of the oldest and I believe the biggest. 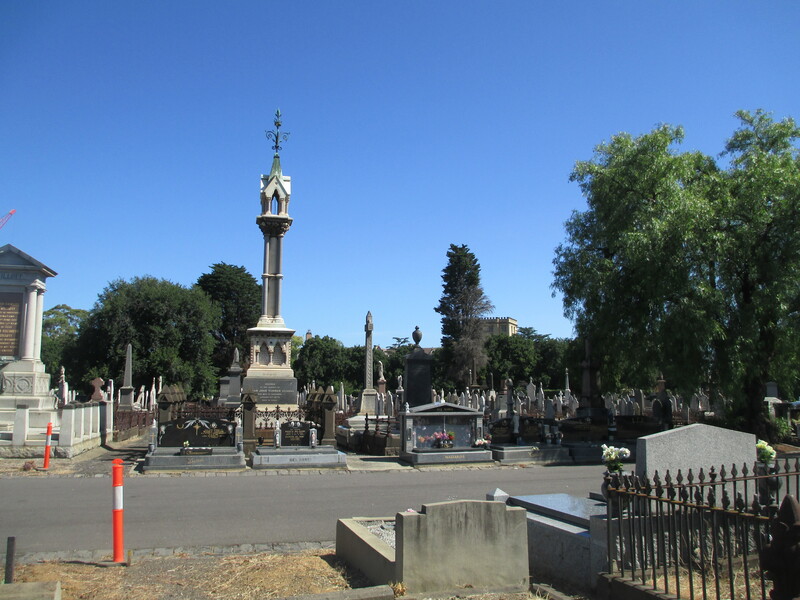 I first went to the Melbourne General Cemetery a year or so ago when I found that my great great great grandfather Robert Henry Woodward was buried there. 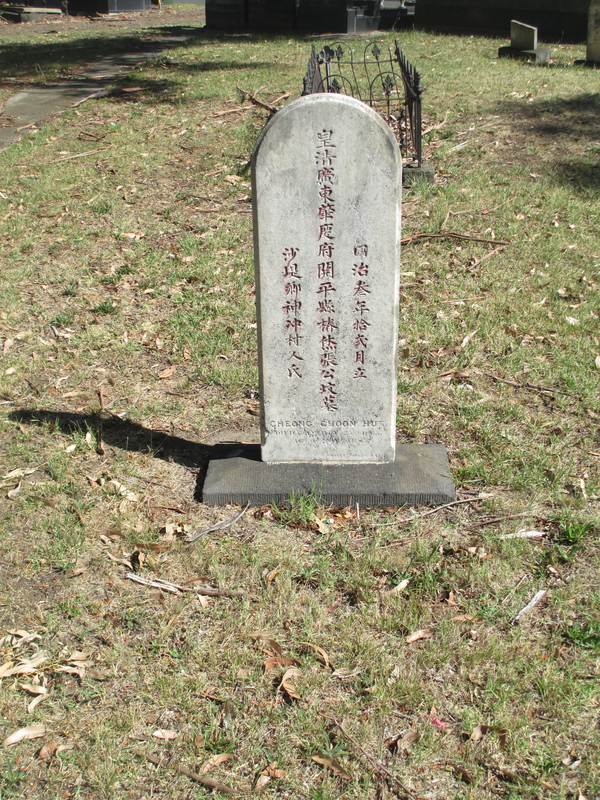 He was one of the first of my ancestors to come to Australia so I was interested to see where his grave was. Unfortunately it is no longer marked. You can see where he is buried in between the two other graves in the photo below. 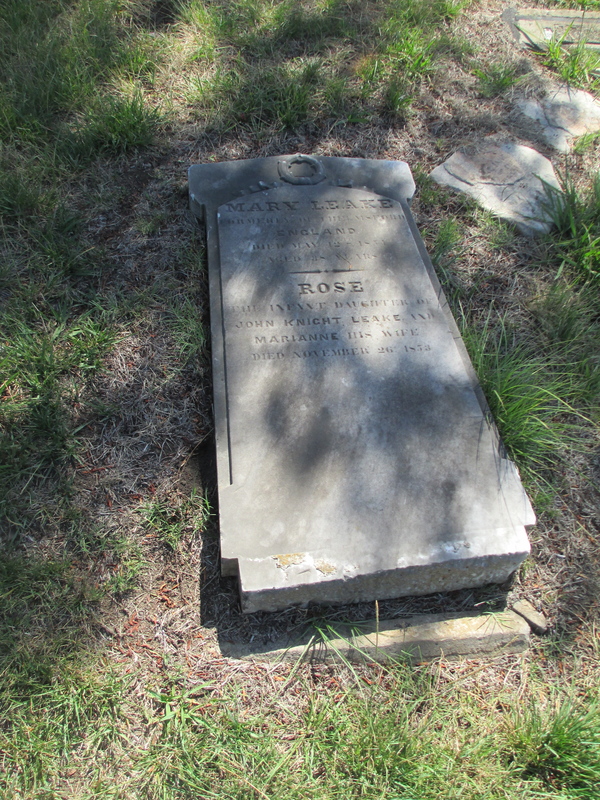 Robert Henry’s is not the only grave that is unmarked in the cemetery because, while the records of those buried survive not all the headstones do. 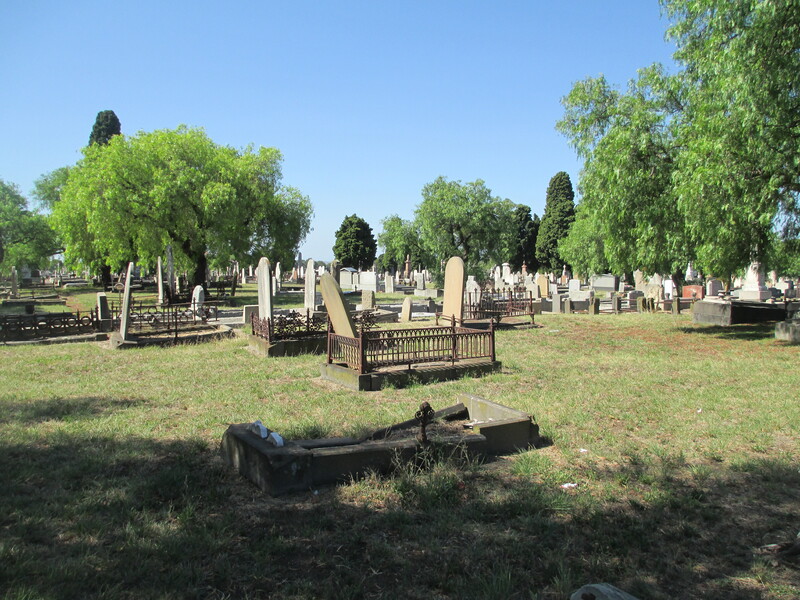 Robert Henry is only one of the approximately 300 000 people buried in the Cemetery since 1853 and their graves can be seen covering a staggering 106 acres. The Cemetery is truly vast. 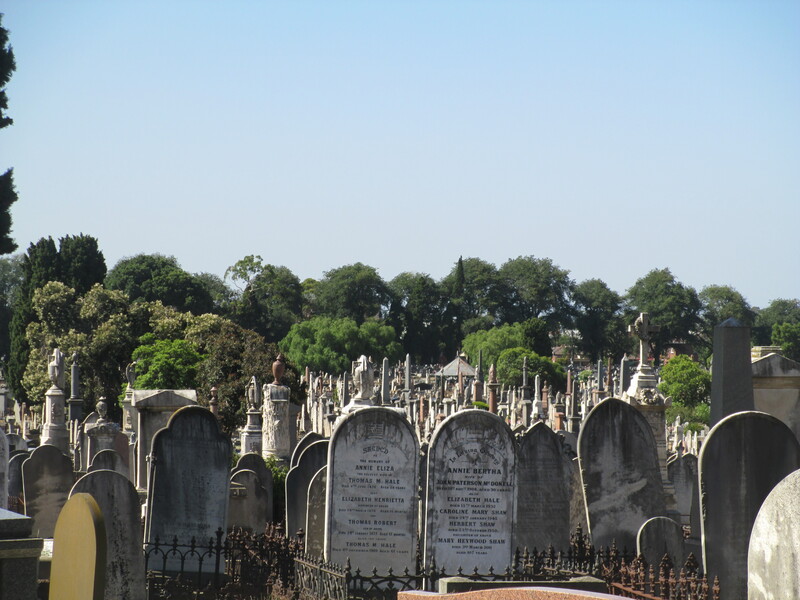 Some burials date even earlier than 1853 though, as a portion of the burials removed from the Old Melbourne Cemetery were re-interred in the Melbourne General Cemetery. 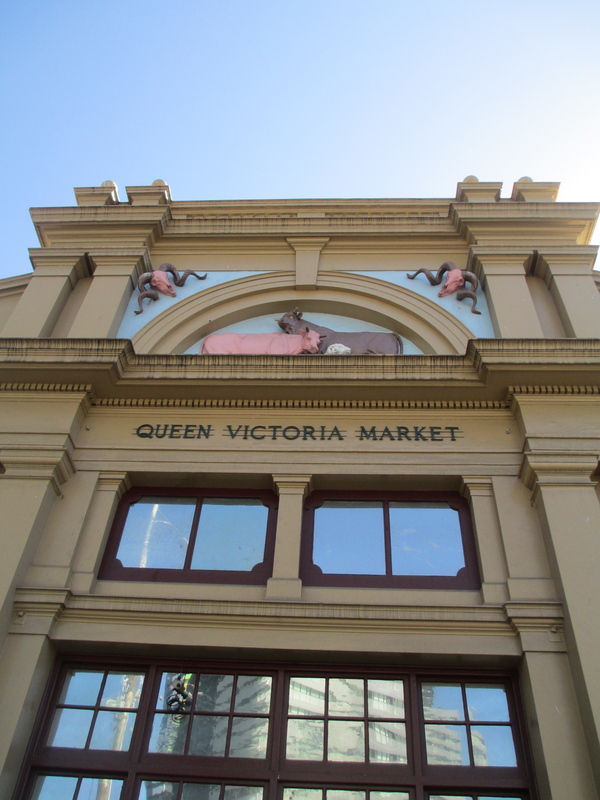 The Old Melbourne Cemetery is an interesting story in itself because it stood on the land that now houses the Queen Victoria Market. 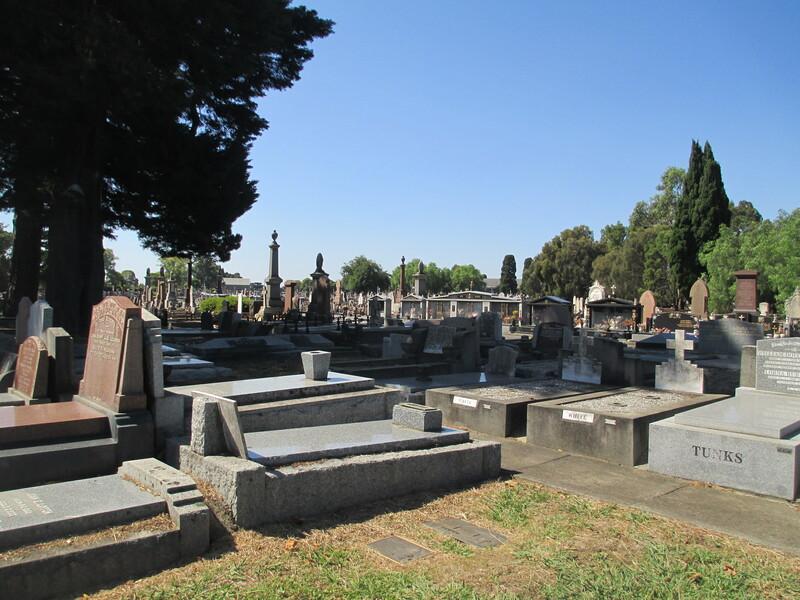 Many of the burials in The Melbourne General Cemetery have interesting origins as well. The cemetery itself is quite varied. As you can see below it is divided into a number of sections. The Cemetery was also designed specially like a public park with winding roads, separate religious rotundas and a large number of evergreen trees and shrubs. There are a number of buildings on site as well, including the heritage listed gatehouse that was rebuilt in the 1930s. The oldest building is the Jewish Chapel which dates to 1854. There are also a number of significant people buried there. Including several Prime Ministers. A memorial to Harold Holt who disappeared while swimming at Cheviot Beach on Point Nepean. 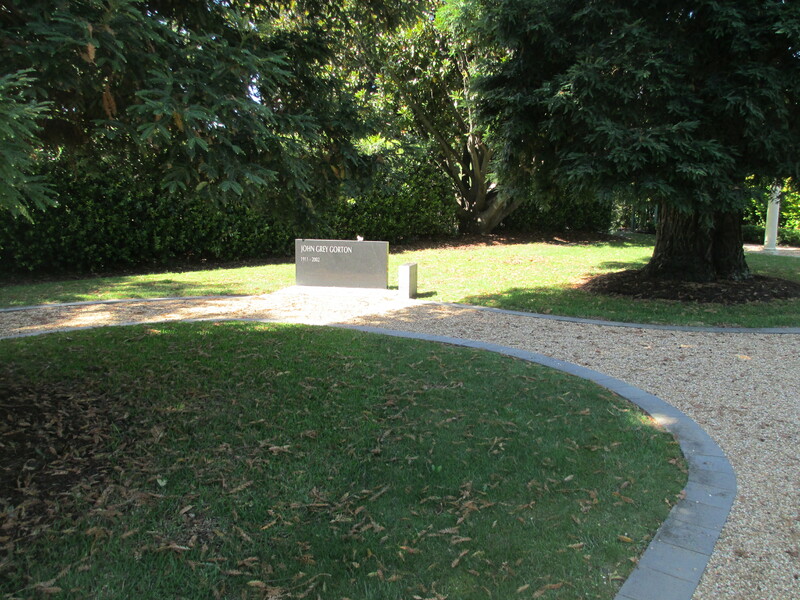 This is a memorial wall to Australia’s Prime Ministers, not everyone listed in dead. There are some very interesting individual memorials as well. 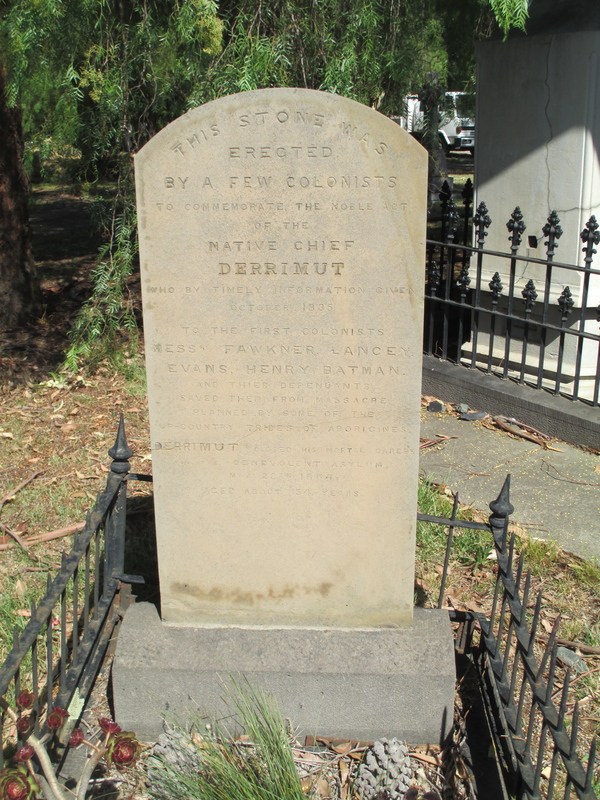 Including the monument below which is dedicated to indigenous man Derrimut whose timely action saved early settlers from a massacre. A memorial dedicated to Elvis. 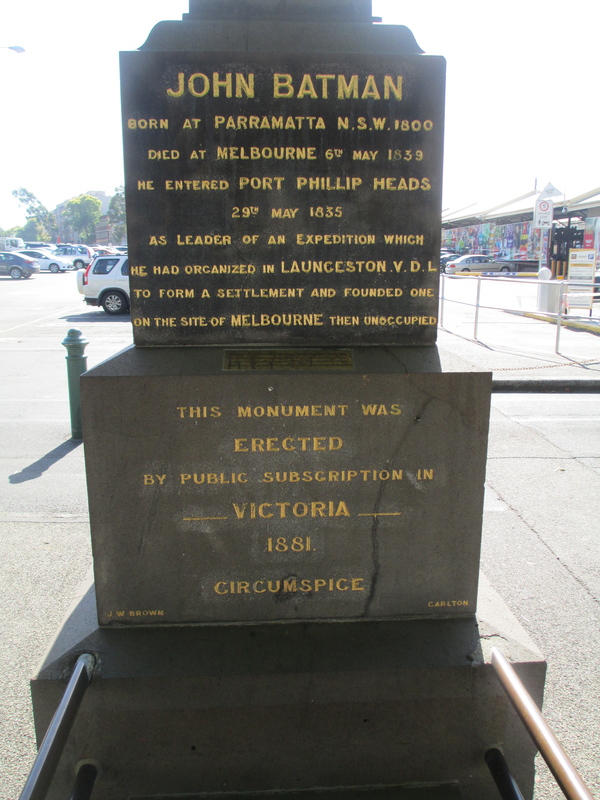 A memorial dedicated to Burke and Wills and their expedition force. 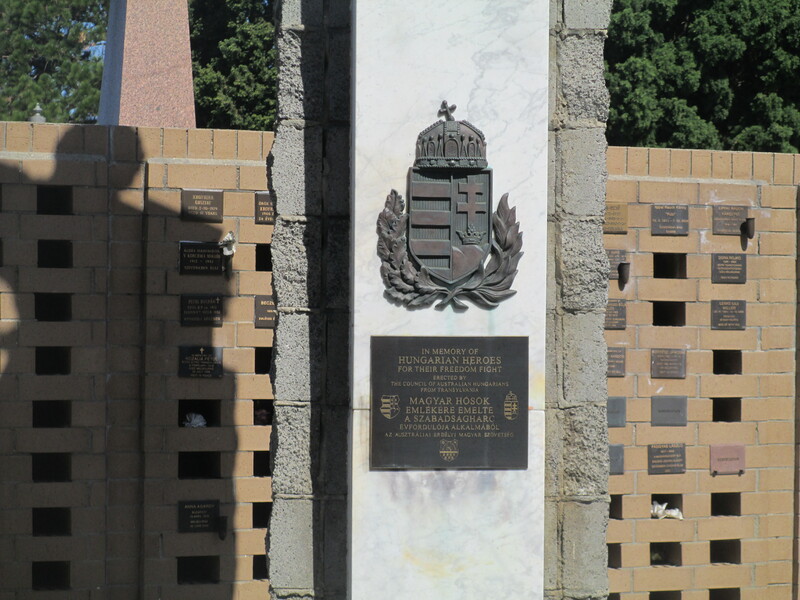 And a memorial dedicated to Hungarian Freedom Fighters. Whole families in one place. Angels and angel like figures. And plaques in the rose garden. 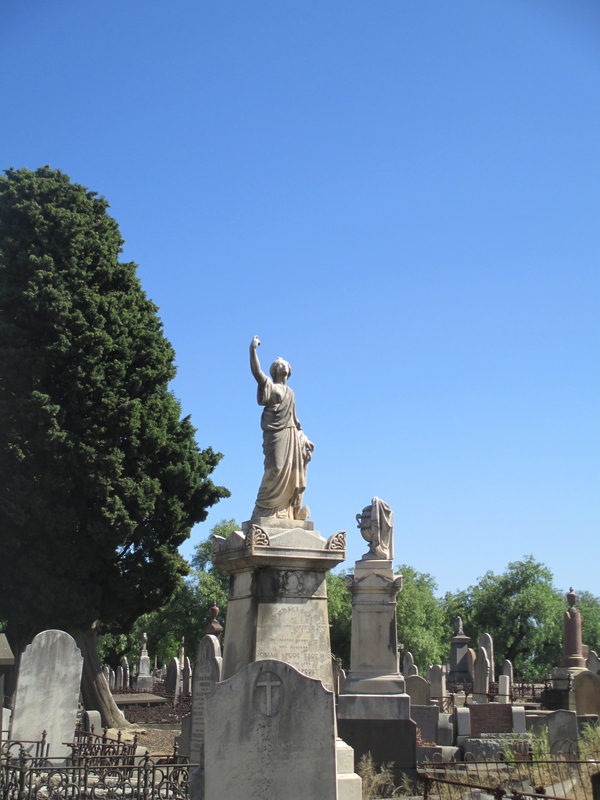 The Melbourne General Cemetery is a fascinating, if overwhelming and slightly haphazard, look into Melbourne’s past. 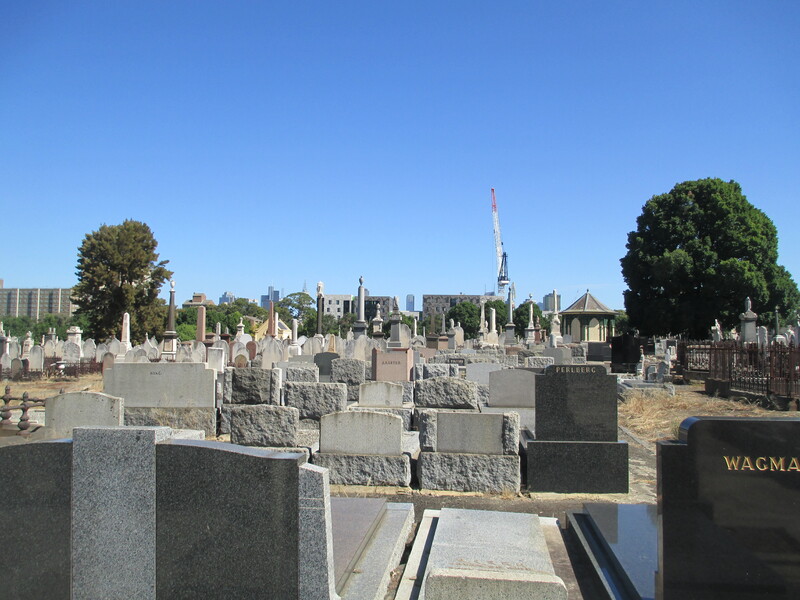 It is also a working cemetery so it will continue to be part of Melbourne’s heritage in years to come. It is well worth visiting not only as a place with a fascinating history, but also somewhere that is surprisingly beautiful and very peaceful. 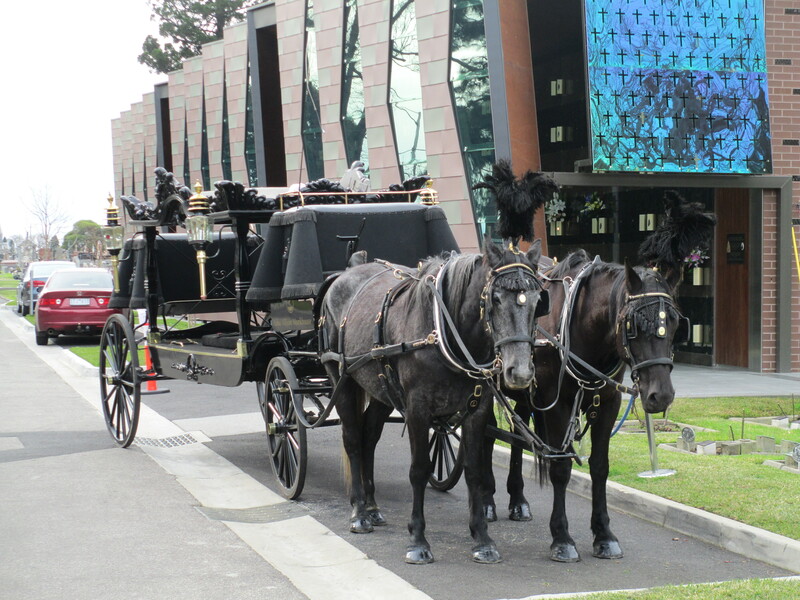 Also if you make it there during Melbourne Open House, you might get to see the vintage hearse. All the photos are mine apart from the plan of the cemetery which can be found at.